Home » BC Network » Events » Hayden Christensen Heads to Star Wars Celebration Chicago! 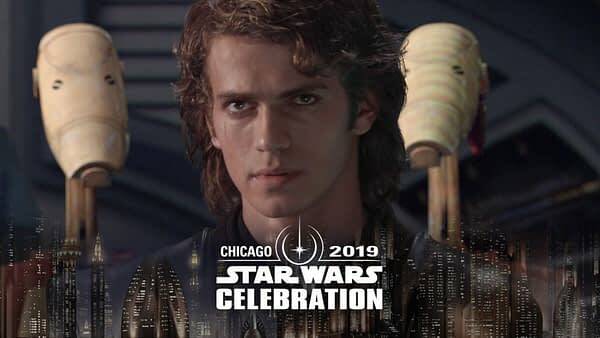 He was supposed to be the chosen one, and after a long absence from the galaxy far, far away Hayden Christensen is headed to Star Wars Celebration in Chicago next month! Christensen played young-adult Anakin Skywalker in the Star Wars prequels, eventually becoming *gasp* Darth Vader at the end of Star Wars: Revenge of the Sith. This means he’ll more than likely be joining the Star Wars: The Phantom Menace 20th Anniversary Panel which was already announced, and you can read the details on his autograph and signing schedule here. We’re super excited to be heading to Chicago for the event which takes place April 11th-15th at McCormick Place. Star Wars Celebration: 'Phantom Menace' 20th Anniversary, More Guests! Star Wars Celebration 2019 Chicago Poster Revealed, Guest Announcements Too!